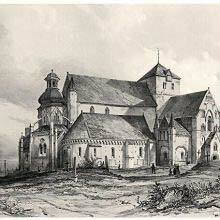 Roskilde Cathedral, Denmark. Tombs of Christian III and Frederick II. View of the sepulchral monuments of Christian III and Frederick II of Denmark in Roskilde Cathedral. The two monuments were created in the sixteenth century, respectively by Flemish sculptors Cornelis Floris and his pupil Gert van Egen. The caption reads in the original French: Cathédrale de Röeskilde, Tombeaux de Chrétien III et de Frédéric II. Danemark.